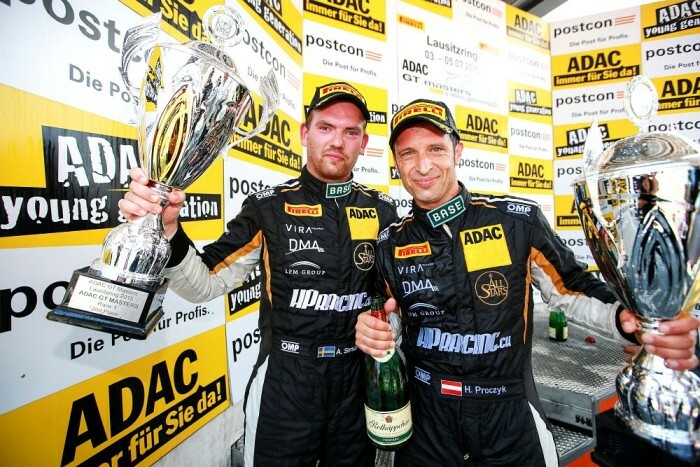 Andreas Simonsen (SWE) and Hari Proczyk (AUT) contested the sixth round of the ADAC GT Masters at Sachsenring for the HP Racing team. 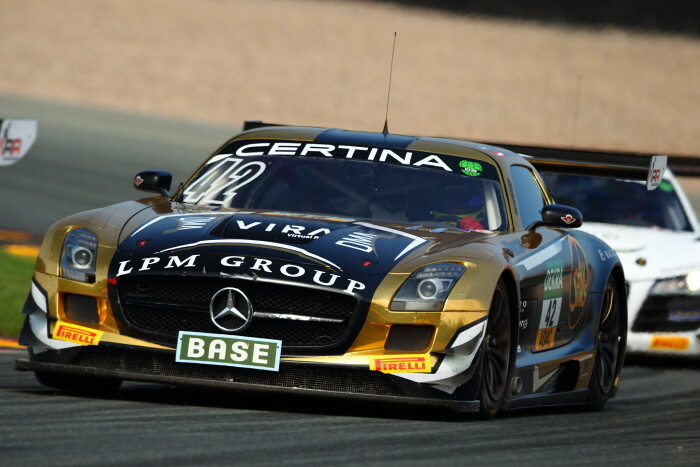 The two drivers at the wheel of the gold & black Mercedes-Benz SLS AMG GT3 have already scored three podium finishes this season. The practice sessions on Friday took place in wet conditions. Therefore, the findings were not very valuable for the qualifying sessions and the races, due to the fact that the weather was perfect on both Saturday and Sunday, resulting in completely different track conditions. Claiming P9 in his qualifying on Saturday morning in slightly wet conditions, Proczyk clocked a lap time of 1:21.515, resulting in a start position in the fifth row for the race on Saturday. Simonsen placed his gull-winged car in P7 for the race on Sunday (1:20.591). In a very good start into the race on Saturday, Austrian Proczyk moved up into P8. He defended the place during his stint in a dominating manner. His team-mate Simonsen took over after 22 laps in a perfect pit stop. He rejoined the race in P6. The Swede had exciting battles with a fellow Mercedes driver, switching positions back and forth several times. At the same time, Simonsen had to fend off constant attacks from an Audi R8, a duel he won in the end. He finished the thrilling and closely-contested race in P6. The thermometer showed a whopping 32 degrees Celsius in time for the start of the race on Sunday. Simonsen scored an ideal position for his SLS in the flying start after the green lights came on. He gained three places early on and moved up into P4 before heading into the pits for the mandatory pit stop after the first half of the race. The team completed a quick and error-free change-over and Proczyk in the gull-winged car rejoined the race in P4. Proczyk managed to fend off the attacks from Stolz at the wheel of the Bentley despite struggling with his Mercedes which started to oversteer. In the course of the race, the Austrian had to let his attacker have the fourth position due to rapidly deteriorating tyres. He drove across the finish line closely behind in fifth place. Andreas Simonsen: “It was raining on Friday and therefore weren’t able to prepare for the qualifying and the races very well, since they took place in dry conditions. Still, the team prepared the car perfectly with an optimum set-up, rain or no rain. We had some bad luck in the first race, when we rejoined the race behind the safety car after the driver change. Otherwise, we could probably have done better. Anyway, it was a good race, and P6 is great. My car was perfect for the qualifying today and I completed two good laps. I was stuck behind a white Audi for a while, otherwise I would probably have clocked a better lap time. Ours was the best Mercedes again and P7 was good. Hari Proczyk (Team Principal): “The free practice sessions on Friday were pretty useless. 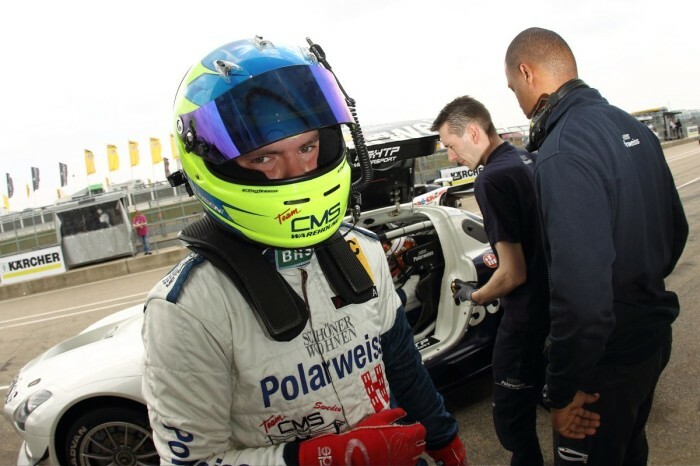 Andreas (Simonsen) still completed his laps, perfecting the set-up just to be on the safe side. The conditions in the qualifying on Saturday were rather difficult, since the track was still pretty wet in the morning and we went out a little too early. Perhaps we would have claimed a better time later on. However, I am quite happy with P9. Both races at the weekend were very good, we were prepared very well and the car ran well. 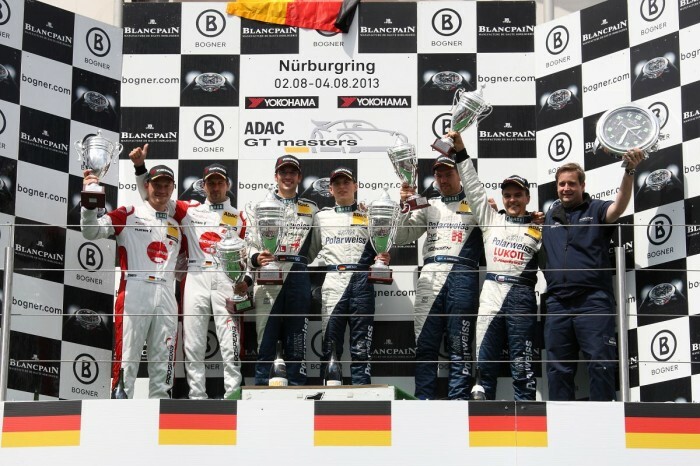 Compared to the other Mercedes team which leads the GT Masters overall ranking our performance was very good. We already knew beforehand that Sachsenring is not ideal for the Mercedes. The team did a great job again and you can really feel that it is coming together and getting better and better. The round at Zandvoort will take place in three weeks time, from 18th to 20th September. Bernd Schneider (DEU) will be back at the event and share the car again with Hari Proczyk as well as at the finale at Hockenheim.